How can I put this delicately? I can't? Fine. There really is a place just a few miles from Naples in the province of Benevento along the Titerno river, 7 km from the small town of Cusano Mutri in the mountainous area known as the Matese ...a beautiful canyon and a series of gorges cut into the rock by ages of splendid erosion... a delight to nature lovers and canyoning enthusiasts. One stretch is called Le Gole di Caccaviola—roughly, Purple Turd Gorge! I have no idea how that name came to be except, after hours of absolutely no scholarship on my part, that it may have something to do with the fact that here is where they found the remains of the dinosaur known as Scipionyx samniticus, an itst-bitsy baby dinosaur from the early Cretaceous period (image, below). It was discovered in 1981 and was the first dinosaur discovered in Italy. The name means Sciopio's Claw from Samnium, also nicknamed "Ciro" by a magazine editor. Ciro apparently ate lizards and fish, which may or may not have turned some of him purple. Also, as it turns out, Purple Turd Gorge is very near the spot of "Hannibal's Bridge." According to legend, this is a bridge crossed by the Big H. and his elephants as they moved down the peninsula during the Second Punic War to visit Carthaginian rage and justice upon the puny Romans. (That didn't work out too well.) As they say, more research is needed. I suggest they try to figure out if Hannibal's elephants ate small dinosaurs. If that doesn't turn your guts purple, I don't know what will. "Forge" is a much better rhyme, but that is Larry's business. Anyway, my friends at Napoli Underground just went over to that neck of the woods to poke around. An account, in English, of their outing is on the NUg website at this link. 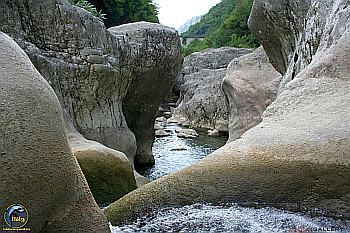 Just four or five km to the east of the area described above, still in the Matese massif, is the Geo-Paleontology Park of Pietraroja at just over 800 meters a.s.l (2400 feet). It is in an area called "the caverns," still karst, but is made up of what is called (from German) Plattenkalk, finely grained limestone conducive to the creation and permanence of detailed fossils or imprints of organisms. You come upon an eerie petrified lagoon of fossils first discovered in 1798. Series of layers reveal fossils from the mesozoic to the miocene on slabs of stone easily visible to the naked eye —rare examples of fossilized fish that are witness to some of the earliest forms of life on earth. This is an area formed by the tectonic mountain building processes that gave us the Alps and Apennines. The presence of fossilized sea life tells us that the area was once under water. The Geo-Paleontology Park is considered one of the most important natural resources in Europe for scholars. It is fitting there should be a museum on the premises, and it is called the Paelolab (pictured), in existence since 2005. It employs multimedia and scale models to try to recreate for visitors what the area must have looked like 110 million years ago, when little Ciro was alive (see image on the left in item above this one. That fossil is in this museum).